A large han near Kayseri, known from old photos, which has seen its stones pillaged by villagers over the years. The Sari Han is located on the Kayseri-Tomarza road, 6 km southeast of Kayseri and 3 km from the village of Kepez. 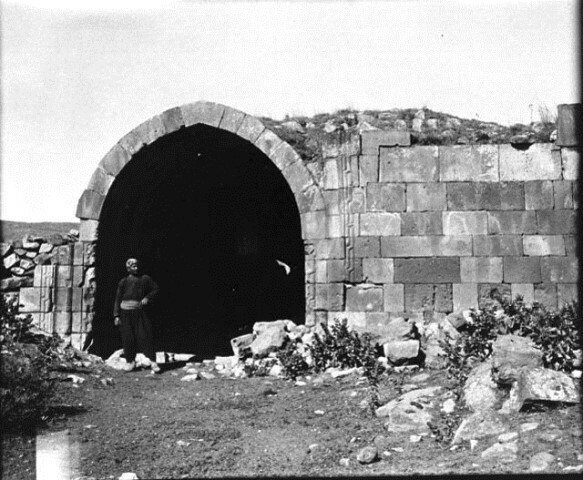 The caravanserai is built on the former Kayseri-Develi-Niğde caravan route. The road passing in front of the Sari Han, built on a rocky terrain on the slopes of Mount Erciyes, continues eastwards towards Malatya. This road originated in Çukurova and was supposedly the second caravan route leading to the eastern cities through Develi and which by-passed Kayseri. There is a spring to the south of the han, whose water was used to supply the han. This han is marked on the map of Kiepert. Riefstahl stated that he noticed the han while traveling east from Kayseri, and that the locals called it the “Sari Han”. 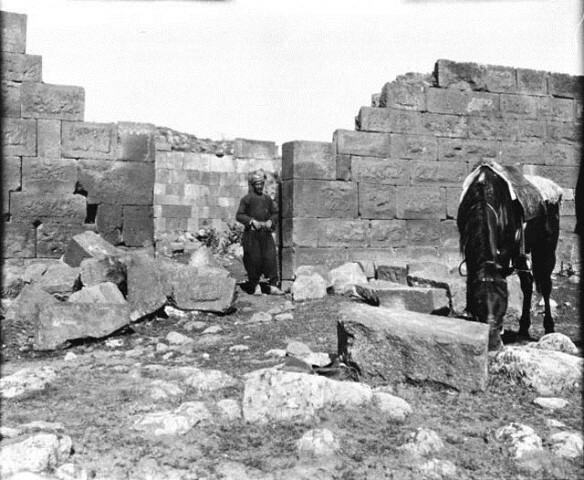 Gertrude Bell, who visited the region at the beginning of the 20th century, photographed the building and called it the Sari Khan. In her two photographs, the han appears to be solid. It is not known why the color yellow has been associated with the han. As the inscription plaque is missing, it is not possible to determine the exact construction date or patron. It can be assumed that it was built at the beginning of the 13th century (1200-1210), as were many of the hans in this region. There is no inscription on the building. The Sari Hayseri Han is built with the classical covered section and open courtyard plan. The covered section and the courtyard are of the same width, and thus it is similar to the plans of the Dokuzun Derbent, Altinapa and Kuruçeşme Hans. The axis of the han is east-west. The crown door is located in the center of the eastern, main wall of the courtyard. The main door has a depressed arch. The south side of the courtyard is comprised of an arcade with three arches carried on two piers. The arcade was covered with pointed vaults heading towards the courtyard in the north-south direction and which had shallow arches. The crown door of the covered section faces east, and has an opening with a pointed arch. This han displays a unique feature in this crown door, as it was designed as an iwan, which is not a common application in Seljuk architecture. On each side of the entry iwan of the covered section door is a square room covered with a pointed vault in the north-south direction. Hans with a similar layout of closed rooms on each side of the entry iwan include the Makit and the Divriği Burma Hans. The covered section, used for lodging, is divided into three naves with two support lines which continue to the rear wall in the east-west direction. Four arches are supported by three piers in each support line. The covered section includes parallel pointed vaults in the east-west direction. The middle nave is higher and wider than the side naves. The piers are also joined to each other by horizontal connecting arches in the north-south direction. The covered section is lit by horizontal slit windows, one in both the north and south walls in the middle of the second and fourth arches, and another one in the wall opposite the entrance. Smooth-faced stone blocks were used in the thick walls, which were infilled with mortar and rubble. 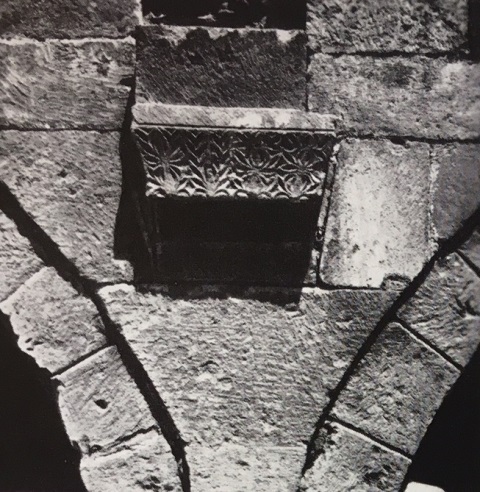 However, the Sari Kayseri Han is the only example of a han which uses the rusticated wall technique seen on the walls of the entrance as seen here. The side walls of the courtyard entrance were built in the rusticated wall technique, which was common in Roman period architecture. Rustication is a masonry technique which carves visible surfaces on the stone to give a deliberately rough or patterned surface. It is not known if this was done to achieve a decorative effect, or if the stones were left undressed due to another reason. The unusual rusticated stones used in the construction can be clearly seen in the photographs taken by Bell. Rectangular buttresses are positioned on the exterior of the north and south walls of the covered section. What little decoration there is on this han is reserved for the crown door of the covered section, on the pilasters on the corners of the iwan and on the consoles above the piers in the courtyard. The consoles have carefully-placed spolia reuse materials. Total external area: 600 m2. The villagers of Kepez removed the stones of the han over the years to build their homes. 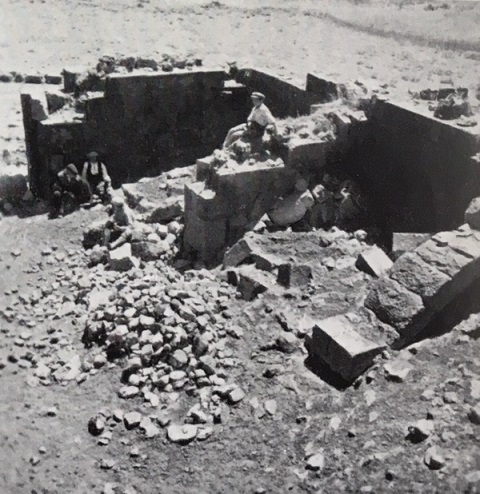 The han was quite solid when Gertrude Bell visited it, but it is now in ruins and only the traces of the foundations are visible. Eravşar, Osman. Yollarin Taniklari (Witnesses of the Way), 2017, pp. 176-179. Görür, Muhammet. “Anadolu Selçuklu Dönemi Kervansaraylari Kataloğu.” Acun, H. Anadolu Selçuklu Dönemi Kervansaraylari. Ankara: Kültür ve Turizm Bakanliği, 2007, p. 521. Erdmann, Kurt. Das Anatolische Karavansaray des 13. Jahrhunderts, 1961. Vol. 1, pp 41-44, no. 6.